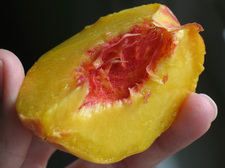 And boy what a treat the donut peaches are. Fix Brothers, just south of Hudson, has finished PYO for the year. Boehm Farm, in Coxsackie https://www.facebook.com/pages/Boehm-Farm-LLC/157892240892440?sk=info should have plenty on sale, not sure about PYO though - I intend to find out this week myself! We've been getting our peaches from the Farm at Kristy's Barn at the Cohoes farmers market. Excellent stuff. My favorite place is called My Other Garden. It's a roadside stand (not pick-your-own) located at the intersection of Route 67 and Cook Road in Charlton. The farm also participates in the Ballston Spa Farmers Market. Fix Bros Farm near Hudson has an enormous number of peach trees for PYO. I went to Love Apple Farm in Ghent last year for PYO peaches and plan to go again this year :) They were fantastic!